RICHMOND, Maine -- Just more than a decade ago, Amy Bouchard drew on her love for baking to create a business in her kitchen making whoopie pies. In those days, she would crank out three at a time. 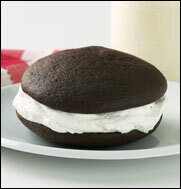 Now, she churns out 5,000 to 7,000 of the sweet Wicked Whoopies each day, shipping them all over the country and beyond. The business has outgrown its bakery in a converted fishing goods shop and will double in size when it moves to a new site in January. The business was born and christened Isamax (IZE-uh-max), from a mixture of her two children's names, Isabella, now 13, and Maxx, 19.